The Doomsdays are running amok! Team Superman tries to hold the line at various points across the globe as Superman confers with Dr. Hoshi on the fact that the Doomslayer seems content to let his minions do most of the heavy lifting. This feels like a distraction to the Man of Steel. The Doomsday Dr. Hoshi had been studying comes to life leading Superman to tell everyone to get out of the room but it turns out that the Eradicator has taken possession of the Doomsday body. Meanwhile the Doomslayer sets in motion the destruction of the Earth as well as all knowledge of Doomsday. Outside Superman uses a cannon to penetrate the interior universe of the floating tower. In Hawaii the Eradicator Doomsday and a team of super-heroes arrive to provide back-up for Superboy. Inside the floating tower Superman declines Doomslayer's invitation to comfort his loved ones while the Earth is destroyed and finds the engines that Doomslayer uses to control the ship. Across the world super-heroes battle the Doomsdays in an epic confrontation. During a break in the fighting the Eradicator reveals his control of the Doomsday he inhabits is starting to slip. As he and the other heroes charge into action Superman makes a shocking discovery. Doomslayer realizes this and gives the order to set all informational engines to maximum in an effort to destroy Doomsday as well as Superman. Story - 4: This was a fun issue. I mean really fun. I must admit that this is my first chapter of the storyline because I am waiting on a few other issues of ACTION COMICS to arrive before diving in and reading the whole darn thing. This is what I get for walking away from the main Superman titles for nine months. In any case I did read the bulk of REIGN OF DOOMSDAY (which is actually the storyline that got me to pick up the Superman titles again) and even though I have missed some pretty big plot elements I never felt lost while reading this issue. I may not have known exactly what happened to the Eradicator, for example, but when the Doomsday body woke up and it was revealed that the Eradicator's consciousness had taken control of it I was good. That's all I needed to know. To get back to my main point this issue was a lot of fun. I had a ball reading it as a matter of fact. This type of story could devolve into silliness in a heartbeat but somehow it never does. For example, the back half of the issue has an Eradicator controlled Doomsday rushing into battle with the Earth's greatest heroes while holding an American flag. Is that a little silly? Well, yeah but it looked cool and I liked it and frankly that was all that mattered to me at the moment. In a way I am starting to look at this story as a good-bye to not only this era of Superman but of the Post-Crisis/Pre-Infinite Crisis era as well. I don't think that was the intention but it is my perception of the material. The meat of this story (to me as a newcomer to this particular arc) is the Doomslayer trying to destroy all knowledge of Doomsday for some reason, which will also destroy the Earth. 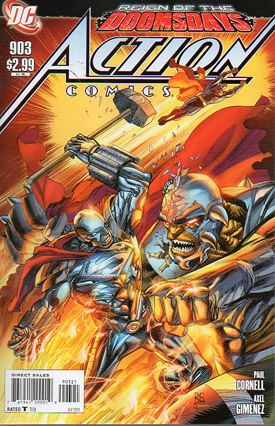 The package it is wrapped in is Steel, Supergirl, Superboy and Superman all having to fight against it alongside a bunch of other super-heroes. It feels like a finale... one grand hurrah before the relaunch in September. So I am enjoying this story on several levels. It is "big, dumb fun" but it is also a last look at these versions of the characters. Add in Cornell's fantastic dialogue and some neat character beats like the scene where Lois says they are going to get take-out, and I am one happy reader. Art - 4: The art in this issue was fantastic as well. It is a tad on the scratchy side for me but not in a distracting sort of way. All of the characters looked epic and there were a bunch of really nice group shots and splash pages that added to the over the top action-y feel of the story. Most importantly Superman looked great throughout the issue particularly in the scene where he breached the walls of Doomslayer's Fortress. The look of determination on his face screamed, "I am Superman and nothing is going to stop me from saving the day." I also liked Gimenez's take on the various Doomsdays as well. It was neat to see different variations on the theme and served to separate them visually. All in all a great issue both in terms of writing and art. Cover Art - 2: The cover was the only part of this issue that I didn't care for and it comes down to the fact that I didn't like Rocafort's style. This is the type of scratchy art that I don't care for. The idea of the cover is fine. 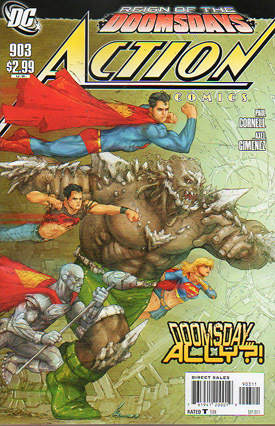 I like the concept of Team Superman running into action with Doomsday. It was the execution that bugged me. Variant Cover Art - 5: I would have preferred to see this as the regular cover. Sure Steel doesn't play a huge part in this issue but this cover is more dynamic than the standard one.